Among the strange concerns listed by the Godlike Production doomsayer Jack Sprat is item number 14, identified as an increase in cosmic rays colliding with Earth. Just where Mr. Sprat acquired this information escapes us. Most people, even the people in the scientific community who study these kinds of things, don’t fully understand what cosmic rays are or where they come from. Cosmic rays are generally described as energetically charged subatomic particles originating from deep space that are zipping through our solar system at great speed. Some of these particles penetrate the Earth’s atmosphere and even walls. Most of these particles are found to be composed of simple protons or hydrogen nuclei. A few are helium nuclei or alpha particles, and a very small fraction of them are composed of heavier elements like lithium, beryllium or boron. The term cosmic ray is a misnomer. The use of the word ray stems from an early belief that the barrage of particles were electromagnetic radiation. It is now found that most of the particles that reach the Earth from deep space are composed of familiar stable materials normally found on Earth. Yet a very small fraction of them are found to be particles of antimatter. And this is the thing that has caught the eye of researchers. While space appears to be an empty black vacuum of nothingness, it has been found to be filled with activity. 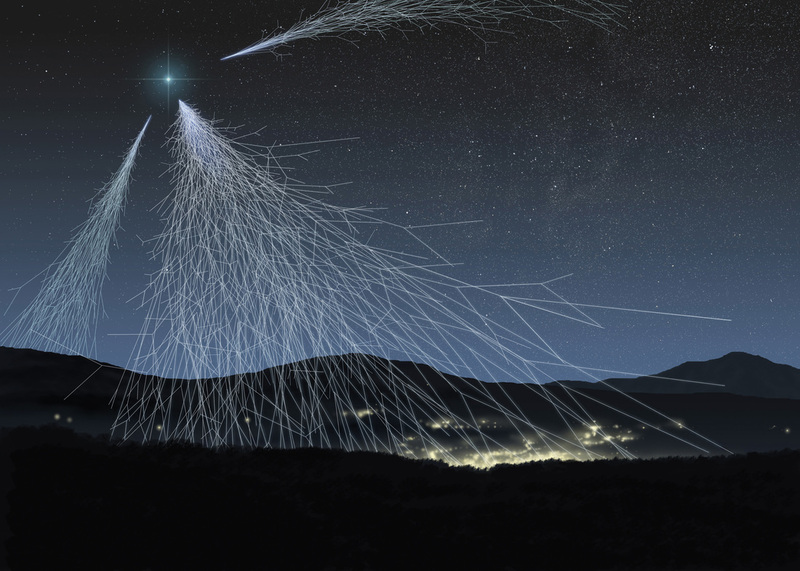 Billions of cosmic rays, for example, are slamming into the Earth each second. Most of them are very low energy particles, but on rare occasions a cosmic ray with extreme levels of energy strikes us. The most powerful yet recorded had an energy level about equal to the pitch of a baseball. Scientists have no idea where this energy comes from. When you rise above the protective shield of the Earth’s atmosphere, outer space is "filled with a bath of fast moving particles known as the cosmic ray flux," according to the web site WiseGeek. The article noted that the rays are considered to be ionizing radiation because they have the tendency to knock electrons away from atoms with molecules, thus creating destructive ions. And this is the challenge for potential space travelers and the astronauts attempting to live in the International Space Station. They are out there where this kind of radiation bombardment can have a serious impact without some kind of protective shield. So much for our attempt to describe cosmic rays in a few brief paragraphs. The question raised by Mr. Sprat is whether Earth is being hammered by more cosmic rays than normal. The answer appears to be no. But then there have been exceptions. Researchers studying rings of trees that once stood in the Northern Hemisphere some 1,200 years ago find evidence that some kind of unexplained high-energy radiation burst hit the Earth about 774 AD. Whatever it was, the event was short in duration, occurring just that single year. The rings for that specific year are laced with remnants of the C isotope, something that forms as a result of highly energetic radiation from outer space colliding with atoms in the upper atmosphere, producing neutrons. The neutrons collide with nitrogen-14, which then decays to form the C isotope. Whatever caused that event happened once, and as far as researchers can determine, it has never happened since. Could it happen? Obviously it would be possible. The whole business of researching the source of this strange energy has had scientists scratching their heads for years. It has been determined that they do not come from our Sun, but rather from deep space. Thus the theories range from great star-bursts and black holes to supernovas. All we know is that there is a lot of energy flying all around in the vast empty void of space at speeds estimated at about 100 miles an hour. There do not appear to be any more cosmic rays slamming into our planet now than there ever have been. But the science of measuring them is so relatively new, nobody can really say for sure if Mr. Sprat is correct or not. Maybe he knows something we don’t know.